The State Library of Iowa actively champions libraries. The two roles of the agency are to improve library services in Iowa and deliver specialized information services to state government and Iowans. The library began as a territorial library in 1838 by an Act of Congress and transitioned to an agency when Iowa reached statehood in 1846, with the mission to provide services to state government. Over the years, this mission grew to include the planning and development of library services on a statewide basis. 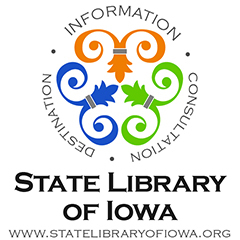 Today, the State Library of Iowa, a division of the Iowa Department of Education, offers a multitude of services and programs to the libraries and citizens of Iowa. Our mission: to provide leadership for Iowa libraries and expand access to information for Iowans. In this Programming Librarian blog series, directors of small public libraries throughout Iowa will share successful programs they have held — without the benefit of big buildings, big staff rosters or big budgets.